Vaelin Al Sorna’s journey continues in Tower Lord. In my mind, this book is all about journeys. It is written in multiple POVs which aids in giving the reader a comprehensive view of the vast and complex happenings in the Unified Realm. When we first encounter Vaelin, he is being followed by Reva, a devout follower of the World Father. Her mission: to recover the sword known as Trueblade and return it to the priest who has beaten obedience, knife fighting, and tracking skills into her since she was a young girl. The story then picks up with Frentis, Brother of the Sixth Order and close friend to Vaelin. Frentis, a captive of the war loving Volarians, is chosen by a woman of brutal martial skills and is forced, by a magical binding, to obey her every ruthless order. The book then moves to Princess Lyrna Al Nieren, whose own diplomatic mission begins in the northern regions of her brother’s realm but ends up in an unexpected place with unforeseen obstacles. As in Blood Song, the reader is privy to certain events through Verniers, formerly the Alpiran Imperial Chronicler, currently reduced to the station of slave/scribe and at the mercy of the Volarian General whose ship is poised to crush the city of Alltor. Confused? I admit to being confused a couple of times. While the various POVs allow the reader to understand the intricate plot on a more intimate scale, they also make it difficult to keep track of minor characters. But not for long, as Anthony Ryan is a master storyteller and through his narrative everything falls into place. For me, the POVs were important because they allowed the main characters to have a voice and through that voice, express their motivations, desires and conscience. 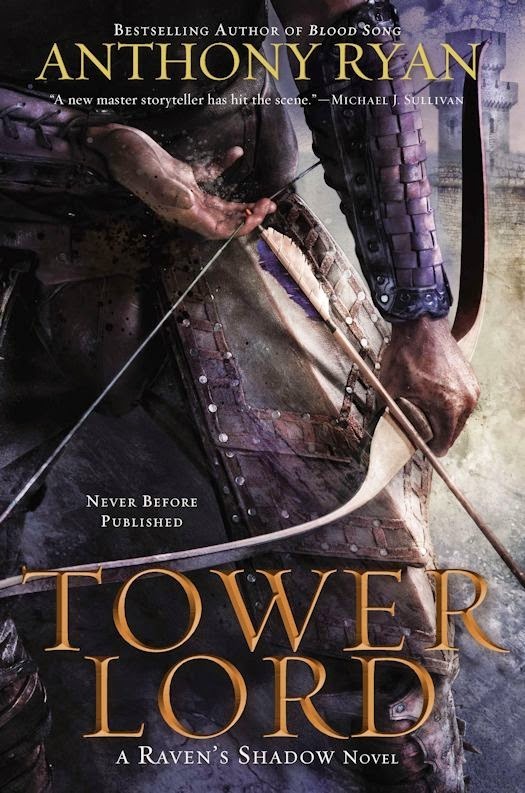 Tower Lord is a dense piece of literature and turned out to be quite a hefty investment of time for me. Was it worth it? Absolutely. I am in awe of Ryan’s world building skills and can honestly place him with my all-time favorites: J.R.R. Tolkien, Joan D. Vinge and Frank Herbert, to name a few. Blood Song was my favorite fantasy of 2013 and Tower Lord is the best fantasy I have read thus far in 2014. Every element is exquisitely wrought and in my mind there are no superfluous details. I love being immersed in this world and can freely admit to developing deep emotional bonds to many of its characters. Tower Lord is high fantasy at its best. There were unexpected endearing moments, callous assassinations, and uncomfortable brutal images. As one would expect with war, many characters are tortured, maimed or killed, but these events are not described in a horrifically graphic or gory manner, so the queasy can rest at ease. There were deaths that I mourned and others that I celebrated. I wasn’t too far into this book when it dawned on me that I was reading something special. To me, Ryan’s greatest gift is that he makes everything seem tangible. Once again, I am transported into his world where I can see determination in an eye, hear the agonized cries of the grieving, feel the spray of the sea, and smell the acrid smoke of a fire raging out of control. This feeling doesn’t happen often; it is truly a magical experience and one that deserves special recognition.